Nearly six years ago, Katie Fisher and her toddler were moving cross-country. Fisher was returning home, within two blocks of her childhood house in Cedar Rapids, Iowa. But she was moving—and it’s a daunting endeavor. Fisher says her planning and detailed checklists made the experience a little less overwhelming. Many businesses can set up automatic recurring payments direct from your checking account or with your debit card. Another option: Use Shine Online Bill Pay to schedule payments to businesses, utilities or individuals. You can go paperless with your credit union too. Dupaco offers eNotifier Alerts and eStatments within Shine Online Banking. Electric, gas and water companies: Call both your current and new utility companies a couple of weeks before moving to ensure your services are stopped and started on time. Financial institution: This is especially important when activating your Dupaco debit or VISA credit cards. You must call from the number listed on your account. Stop by any Dupaco branch or call 800-373-7600 to update your contact information. To jog your memory on the businesses you need to notify, reference the account you use to pay your bills, either your checking account or credit card statements. More merchants are making it easier to change your address online, which can save time, Fisher says. Find your nearest credit union branch. 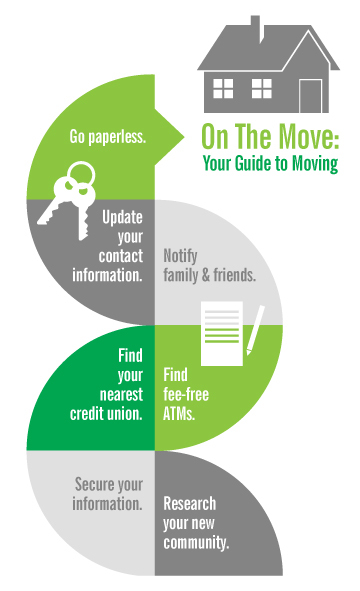 Before you move, locate your closest credit union branch, whether that’s another Dupaco location or a Shared Branch. The CO-OP Shared Branch network is a cooperative endeavor that allows you to stay connected to Dupaco no matter where you go. It offers you fee-free, face-to-face access and service at more than 5,000 credit union branches. Dupaco’s mobile app can point you to your nearest Shared Branch. Find fee-free ATMs. You also can use Dupaco’s mobile app to locate your nearest Dupaco ATM or Privileged Status ATM. Thanks to Dupaco’s partnership with the SHAZAM Network, you can use your Dupaco MoneyCard in ATMs of other participating Privileged Status financial institutions without paying surcharge fees. Secure your information. Before everything is packed, make sure your private information (such as Social Security cards and other account identifiers) are secure and accessible to you—and only you. “You want to know exactly where that important stuff is,” Fisher says. Research your new community. Before moving to a new city, do your homework on the community. Go online to learn more about the city’s offerings. Ask friends or family in the area for suggestions on everything from favorite grocery stores to schools to TV providers. Glean insight from your employer. And don’t hesitate to talk to your credit union, Fisher says.